Aliens is a film that has quite a few memorable lines, but few stand out as much as the one spoken by a little girl. Let me see if I can recall it from memory... "They typically emerge after the day has ended. Usually." Is that right? Anyway, Aliens turns 30 this year, which I suppose should make me feel old, but it doesn't. You know what does, though? Homestar Runner turns 20 this year. Let that sink in. For the film's thirtieth, NECA has given fans a long-desired figure that they long said couldn't be done. But that's pretty much NECA's M.O. at this point, right? This time, it's Rebecca Jorden, aka "Newt," the only survivor of the colonists of Hadley's Hope. Unfortunately, it's not a retail release, but a San Diego Comic-Con exclusive, and sadly this year NECA didn't make limited amounts of exclusives available via their website as they've done in years past. However, NECA's Randy Falk has said they're working to try and get Newt out to the people, though specifics have yet to be revealed. My money's on a two-pack. Back to Newt the character. The Colonial Marines and Ripley discover Newt, dirty and malnourished, sneaking around in the ventilation ducts to hide from xenomorphs. But did you ever wonder why a little kid was in this film, besides the fact that James Cameron likes to put kids in R-rated movies? It's not like she's an audience surrogate. 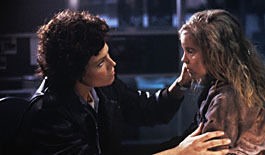 The film shows that Ripley becomes sort of a maternal figure to Newt as the film goes on, feeling obligated to protect her. Newt even calls Ripley "mommy" and runs to her for a hug after the action is all over. But in the theatrical version, there's no real motivation behind Ripley nurturing and connecting with Newt, beyond the usual stereotype of women being nurturing or something. This is expanded upon in the director's cut of the film, which I would definitely recommend seeing if you haven't already. In it, we discover that Ripley had a daughter, and that her daughter had passed away at some point during Ripley's nearly 60 year journey floating aimlessly through space. Of course, recent videogames have given her daughter her own wacky alien adventures, which is a bit Jaws 4ish, but the fact remains that Ripley acts like a mother because she actually is one, and in Newt she finds something of the daughter she lost. Also, in the director's cut, it turns out Newt's parents are the ones who bring the aliens to the colony after discovering the derelict ship from the original film and returning with a face-hugged father. With that out of the way, let's check out the figure. Her sculpt is quite good, from her tangly head of hair to her torn denim overalls. Said overalls are made of a separate, flexible piece that fits over her torso. One of the suspenders straps over her shoulder, and the other is undone, sculpted onto the back of the piece. It's a good way to allow for more articulation without breaking up the sculpt too much. It's a nicely detailed sculpt, with lines and stitching in the denim and tiny laces on her tiny Adidas sneakers. The face is recognizably Carrie Henn, with a slightly worried look that she wore throughout most of the film. The paint compliments the sculpt nicely. There's lots of weathering and wash, but it makes sense here that it's overdone. It nicely replicates the grimy, filthy look of the clothes she'd been wearing for weeks. Her skin is pale and sallow, and the detail work is crisp and clean (for lack of a better word). Newt gets a decent range of articulation. She's got a balljointed head, peg and hinge shoulders, elbows, hips and knees, a balljointed chest joint, and balljoints in the wrists and ankles. Some of the joints are very tight, so extreme caution is recommended when moving them the first time. It's not like getting a replacement Newt is easy. The hip joint seems to move both legs at once, and I'm not sure if this is on purpose or due to a stuck joint, but I'm not going to test it. Her articulation allows her to wrap her arms around Ripley's neck and her legs around Rip's waist, so she can be carried just like in the film (and on the iconic poster image). She looks great, and it's awesome that NECA ensured the figure could move enough to recreate this look. Newt's a small figure, but she's a 100% new sculpt and likely one that won't receive a ton of reuse. Thus, she's not bursting with accessories. However, she gets a decent number of extras, and they're all pretty neat. Well, mostly neat. There's a handheld lamp, like the one that came with NECA's Bishop figure, but this one is a different sculpt, lacking the orange squares on the back of the casing. Other than that kinda boring accessory, we get some really cool stuff. She gets Hicks's helmet, which is 100% removable. Unfortunately, Hicks can't wear it well, since there's sculpting inside that's meant to match with Newt's hair. She's also got her doll, Casey. Or what's left of her. She's seen some rough days and is now just a head. This is a tiny, tiny accessory, but really well done and a a nice inclusion. And lastly, we get a tiny replica of her lucite Second Grade Citizenship Award. It's got tiny stickers featuring a photo of Rebecca in better times, and a plaque with her true name. Newt is an excellent addition to any Alien collection, but not one that's easy to come by, at least not yet. It's a shame that she's so hard to get, but it's unlikely that she's going to see a single packed retail release. 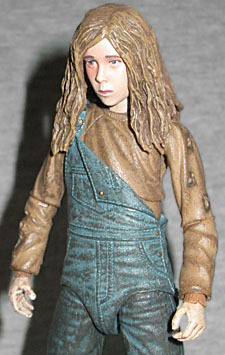 NECA has said time and again that human figures are a tough sell in their Aliens line, and a figure of a little girl would be an even tougher sell. Hopefully they're able to find a way to get her out though, because this figure is one that any serious collector is going to want for their display.